They say one of the keys to a lasting romance is learning and growing together—what better way to embody that wisdom than by taking a class together? New York City offers a range of classes for couples looking for a beyond-the-tourist-traps experience, including ones for foodies, cheese lovers, and more. We’ve picked some of our favorites that will make for the perfect date in the city. Whether it’s your first date or your 20th anniversary, this couples class will add a little sugar to your life. Join renowned cupcake bakery Butter Lane for an intimate class just for couples—you’ll mix, scoop and ice cupcakes like a pro and learn various recipes to make bakery-quality treats at home. Plus, every couple will take home a dozen delicious cupcakes of their own! Get creative with your sweetie and enjoy complimentary wine and unlimited inspiration as you re-spark your inner artists as a couple. In this brushstroke-by-brushstroke painting experience at The Art Studio NY, you’ll learn a variety of painting techniques that are perfect for all levels and walk away with your very own masterpiece. Spend a special night with your significant other at Home Cooking New York's cooking studio nestled in Soho. You and your beau will learn the art of making petit beef filet with wild mushroom ragout, individual pommes anna and string beans amandine, then enjoy eating your fabulous creation. Ready to tango? Learn the fundamentals you’ll need as a couple to navigate the dance floor. The instructors at Triangulo dance studio will get you ready to hit the NYC dance clubs in style. Closest Subway: 1 to 23rd and 7th Ave.; F or M to 23rd and 6th Ave.
Want to make better pizza at home? 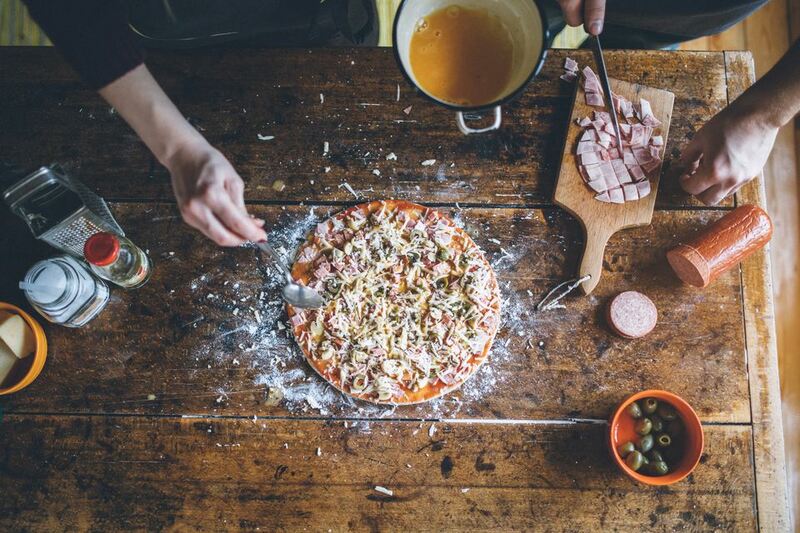 This class is designed to help you learn the skills and tricks of preparing wonderful pizza within the limitations of a home kitchen and they even have a special Couples Workshop!